BANJA LUKA/SARAJEVO/COPENHAGEN – Health ministers from South East Europe are devoting two days to considering how to involve other crucial sectors in reducing death and disease in their countries. The Third Health Ministers’ Forum is meeting in Banja Luka, Bosnia and Herzegovina, on 13–14 October 2011, attended by health ministers and high-level officials from the 10 countries in the South-eastern Europe Health Network (SEEHN). The Forum is a unique body that was set up in the context of the Stability Pact for South Eastern Europe, following the economic collapse and conflict that tore parts of the region apart in the 1990s. In the last decade, the health ministries in its member countries have worked closely together and with WHO/Europe in a formal regional cooperation on public health, now supported by the Regional Cooperation Council (RCC). Noncommunicable diseases (NCDs), such as cancer, heart disease, respiratory disease, stroke and diabetes, are the biggest killers in these countries, as they are across the entire WHO European Region, where they cause 86% of deaths and 77% of the disease burden. Although life expectancy is on the rise throughout the Region, inequities persist. Even in SEEHN’s member countries, which have now shared experience and policies for many years, life expectancy ranges from 69 years in the Republic of Moldova to 81 years in Israel. Health in all policies is an approach that is high on the public agenda. WHO is developing a new European policy for health and well-being, Health 2020, that endorses this approach and builds on the lessons learned from the implementation of the Tallinn Charter: Health Systems for Health and Wealth. In addition, the political declaration on NCDs made by the United Nations General Assembly in September 2011 stresses the need to strengthen national policies to support multisectoral national policies and plans. That declaration came just after WHO’s European governing body, comprising representatives of the 53 countries in the European Region, endorsed WHO/Europe’s action plan on NCDs. These major policy milestones are based on sound evidence of what works. 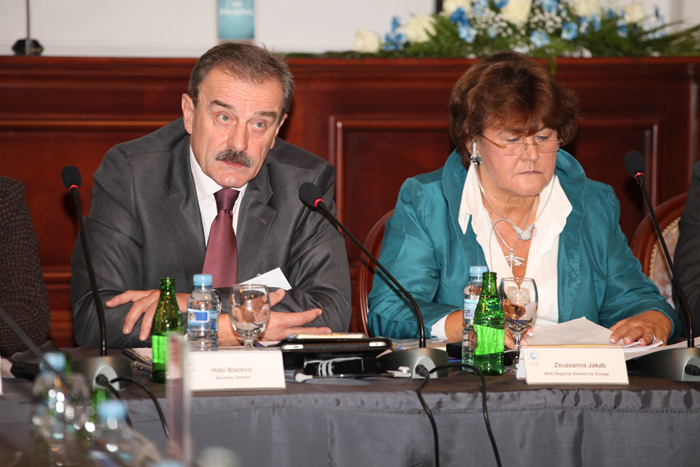 The Forum, entitled Health in All Policies in South-eastern Europe: a Shared Goal and Responsibility, is attended by health ministers from SEEHN’s member countries (which are also members of the RCC), and partners such as the European Commission, the Council of Europe, the Council of Europe Development Bank, the International Organization for Migration and policy-makers from different sectors. On Friday, 14 October, the ministers at the Forum are expected to sign the Banja Luka Pledge, which will indicate the commitment of the countries’ health ministries to working towards health in all policies. The Forum is being organized by the SEEHN Presidency, Executive Committee and the Secretariat, jointly performed by WHO Regional Office for Europe and the Council of Europe in the framework of the Regional Cooperation Council and in collaboration with Bosnia and Herzegovina, represented by the Ministry of Civil Affairs of Bosnia and Herzegovina, the Ministry of Health of the Federation of Bosnia and Herzegovina and the Ministry of Health and Social Welfare of Republika Srpska. Speech by the RCC Secretary General, Hido Biscevic, at the event’s opening is available HERE. These countries are Albania, Bosnia and Herzegovina, Bulgaria, Croatia, Montenegro, the Republic of Moldova, Romania, Serbia and the former Yugoslav Republic of Macedonia. Slovenia also participates in the SEEHN, and Israel has joined during the Forum. SEEHN was set up with the support of WHO/Europe in the context of the Stability Pact for South Eastern Europe, the international community‘s first comprehensive conflict-prevention strategy, to strengthen countries’ efforts in fostering peace, democracy, respect for human rights, economic prosperity and security. The Stability Pact was succeeded by the RCC, a cooperative framework for countries in the region with the goal of promoting cooperation and European and Euro-Atlantic integration of South East Europe in order to inspire development to benefit the region’s people.